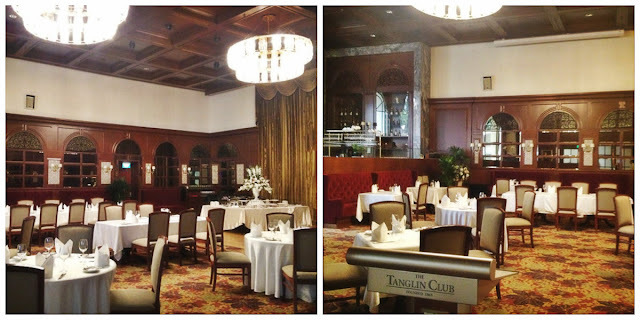 The Tanglin Club is one of the most prestigious social club in Singapore. It was founded in 1865 by Singapore's first Police Commissioner, Thomas Dunman. In 1865, it was catered to the recreational needs of the locally-based British officials and expatriates. Although race was not stipulated as a criterion for membership, only Europeans were admitted. Till date, they have up to approximately 8000 memberships from around 70 different nationalities. It is located in town, off Steven's Road. The club have 4 restaurants, 5 bars, a cinema, 2 libraries, 1 gym, 2 swimming pools, 4 billiard tables, 4 outdoor and 2 indoor tennis courts, 8 squash courts, etc. This exclusive club is currently reciprocated with 135 clubs world wide. In the 1930, the ballroom is reputable for having the best dance floor in SIngapore and the club band was always their strong key attraction. Till date, an annual Tanglin Ball is held at the Churchill Room, which is a icon of the club. FUN FACT: On 26 June 1866, Tanglin Club purchased a property in the Claymore Estate for $600. Monthly Fee: $85 (Single) & $170 (Couple). Term Membership for Expatriates (a few years): $4,500 per Annum. Monthly Fee: $$85 (Single) & $170 (Couple). FUN FACT: This beautiful chair is found in the "Ladies Room" at the club's lobby. I had lunch at Tavern yesterday, I had their Foie Gras for my appetiser, their Ladies Cut Beef Steak (medium rare), and Creme Brulee and Chocolate Lava Cake for desert. Their Ladies Cut Beef Steak is delicious! The Churchill Supper Club open its doors to all members and their guests on every Friday and Saturday nights, to feast, dine and dance. 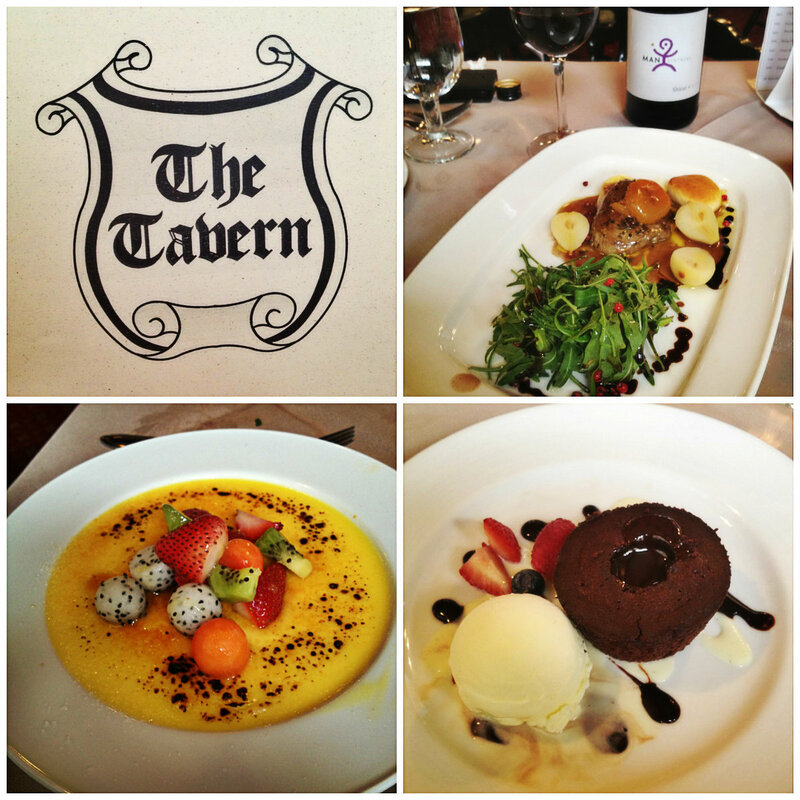 They have a sumptuous spread of 4-course set dinners to a semi - a la carte menu. Their room seats around 60 people only, hence a reservation is usually essential to get a table there. Those who would like to just drop by after dinner, there's a cover charge of $18.80 to enter. There, you may enjoy some canapés, wine, and dance to their resident band, Penny Lane. Drinks & Band Time: 8pm onwards. Cover Charge: $18.80 / person, includes canapés and a house pour. 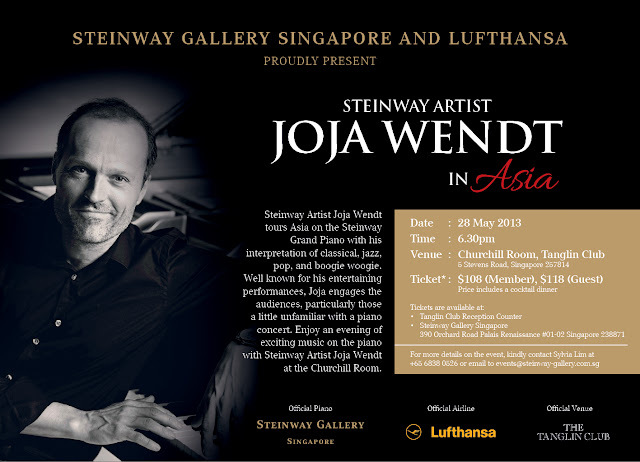 Steinway Artist Joja Wendt tours Asia on the Steinway Grand Piano. His beautiful pieces of his interpretation of jazz, classical, pop and boogie woogie, would entertain you through your night. Joja is known for his entertaining performances as he engages with his audiences. Date: 28 May 2013, Tuesday. Ticket Price: $108 (Members) $118 (Guest) includes a cocktail dinner. Tickets: Club's Reception Counter or Steinway Gallery Singapore at Palais Renaissance #01-02. Sponsors: Steinway Gallery Singapore, Lufthansa Airlines, Tanglin Club. 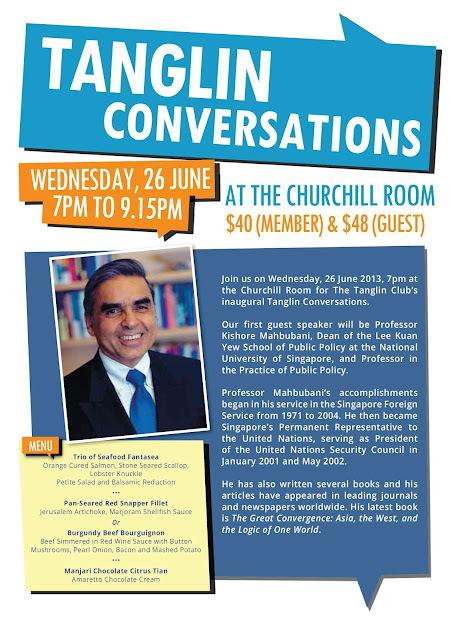 Guest Speaker Professor Kishore Mahbubani, Dean of the Lee Kuan Yew School of Public Policy at the National University of Singapore, and Professor in the Practice of Public Policy. He is the President in the United Nations Security Council in Jan 2001 to May 2002. He has written several books and his articles have appeared in journals and newspapers world wide. FUN FACT: Kishore Mahbubani is the author of The Great Convergence: Asia, the West, and the Logic of One World. Ticket Price: $40 (Members) $48 (Guest) includes a cocktail dinner.